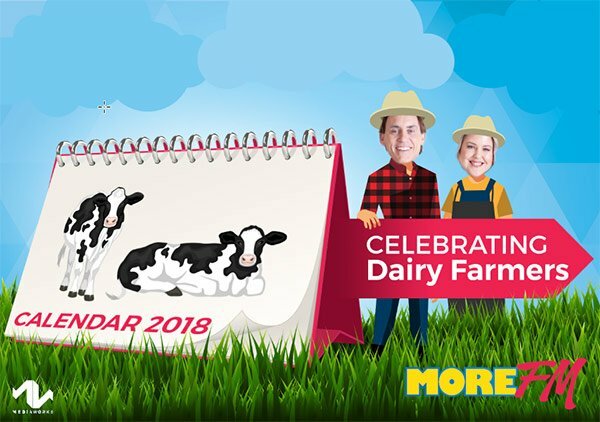 DairyNZ has created a fun calendar with More FM celebrating dairy farmers. Twelve dairy farmers, of all ages, were selected for the calendar from a competition DairyNZ ran with More FM, where people were asked to nominate awesome farmers. More than 50 farmers were nominated, with great stories and photos about their lives on the farm. The 12 farmers selected had great shots of them taking part in various farming activities including looking after their cows, calf rearing and hay baling. The calendar has key dairying events such as DairyNZ Farmers’ Forum and Fieldays – but it also has fun entries. World Chocolate Day or Grilled Cheese Sandwich Day, anyone?